A group of Europe's leading research libraries and technical information providers has established a partnership to improve access to research data on the internet. The German National Library of Science and Technology (TIB), the British Library, the Library of the ETH Zurich, the French Institute for Scientific and Technical Information (INIST), the Technical Information Center of Denmark and the Dutch TU Delft Library all signed a Memorandum of Understanding to this effect during the meeting of the International Council for Scientific and Technical Information (ICSTI) in Paris on 2 March 2009 (see below). The goal of this cooperation is to establish a not-for-profit agency that enables organisations to register research datasets and assign persistent identifiers to them, so that research datasets can be handled as independent, citable, unique scientific objects. "This is an important step in developing a strategy in a new field of responsibility and services for libraries and other information providers", said Uwe Rosemann, Director of TIB. Maria Heijne, Director of the TU Delft Library added: "Citability of research data will reward researchers and therefore hopefully convince them that long term data preservation is worth while." As a first step, this agency will build on an approach developed by TIB and promote the use of Digital Object Identifiers (DOI®) names for datasets. A DOI name is used to cite and link to electronic resources (text as well as research data and other types of content). The DOI® System differs from other reference systems commonly used on the Internet, such as the URL, since it is permanently linked to the object itself, not just to the place in which the object is located. Since 2005 TIB has registered around 600,000 research data sets with a DOI name to allow easy access and improve citability (http://www.tib-hannover.de/en/the-tib/doi-registration-agency/). The long term vision of the partnership is to support researchers by providing methods for them to locate, identify, and cite research datasets with confidence. Further countries and organisations are encouraged to join the partnership. Recognizing the importance of research datasets as the foundation of knowledge and sharing a common commitment to promote and establish persistent access to such datasets, we, the signed parties, hereby express our interest to work together to promote global access to research data. Our long term vision is to support researchers by providing methods for them to locate, identify, and cite research datasets with confidence. In order to achieve this long term vision, we will establish a not-for-profit agency that enables organisations to register research datasets and assign persistent identifiers to them. The agency will take global leadership for promoting the use of persistent identifiers for datasets, to satisfy needs of scientists. It will, through its members, establish and promote common methods, best practices, and guidance. The organisations will independently work with data centres and other holders of research data sets in their own domains. As a first step, this agency will build on the approach developed by the German National Library of Science and Technology (TIB) and promote the use of Digital Object Identifiers (DOI) for datasets. Nevada is a land of wide open spaces that stretch for miles contrasted with the busy streets and lights of Las Vegas and Reno. Its history is tied to the Paiute, Shoshone, Washoe, Asian Americans, African Americans, Basque, Hispanics and Euroamericans who settled the Great Basin over the centuries. Nevada's economy is driven by ranching, mining, military installations, tourism, gambling, and the railroads. The state's archives, libraries, special collections, museums, historical repositories, and state, tribal and local government agencies are the holders of a rich collection of Nevada's history. For over 10 years, Nevada's cultural heritage institutions and allied information providers have been digitizing their collections and providing access via the Internet. In 2008 the Nevada State Library and Archives implemented a statewide digital planning process, working with a Statewide Digital Advisory Committee and utilizing the services of Liz Bishoff (BCR Digital and Preservation Services) and Tom Clareson (Lyrasis New Initiatives). The project was funded with Library Services and Technology Act (LSTA) monies through the Institute of Museum and Library Services (IMLS). The planning process included a statewide survey involving an audience of 110 institutions. A total of 61 completed surveys were received for a response rate of 55%. The resulting Nevada Statewide Digital Planning Survey Summary Report provides for an informed assessment of the state's digital collections and holding institutions. Additionally twenty organizations reported creating or acquiring born-digital resources including photography or other still images, simple text, encoded text (including blogs, websites, listservs and PDF documents), digital audio, and digital video. Institutions in the state with digital collections searchable via the Internet include the University of Nevada Las Vegas (UNLV), University of Nevada Reno (UNR), Henderson District Public Libraries, Las Vegas-Clark County Library District, the Cooperative Libraries Automated Network (CLAN), and the Nevada Department of Cultural Affairs. Of those institutions, UNLV, UNR, CLAN, and the Henderson District Public Libraries have implemented cross platform searching of their ContentDM databases utilizing Google. Information about the Nevada Statewide Digital Initiative is available on the Nevada State Library and Archives website. The planning document is currently in process and will be linked on the site when it is finalized. The Statewide Digital Advisory Committee has identified a number of ongoing activities for this coming fiscal year which are also identified on the website. Mark Twain made the Mississippi Valley of the nineteenth century an integral part of American historical memory in The Adventures of Tom Sawyer, The Adventures of Huckleberry Finn, and Life on the Mississippi. The Mark Twain's Mississippi Project (http://dig.lib.niu.edu/twain) has gathered a significant set of primary source materials from the collections of participating institutions (Northern Illinois University Libraries; The Newberry Library; the St. Louis Mercantile Library; and Tulane University Libraries) in order to provide World Wide Web users with an opportunity to compare Twain's observations and characterizations of life on the nineteenth century Mississippi with the historical record. 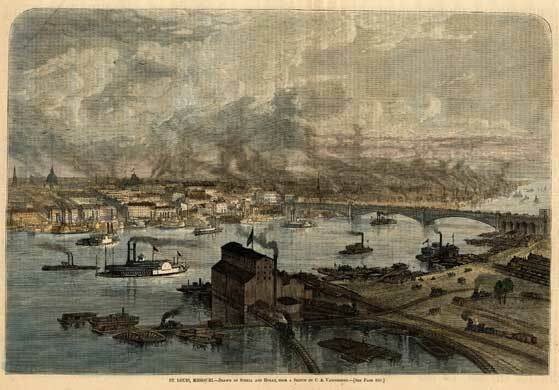 In addition to Twain's celebrated Mississippi works themselves, collected materials include steamboat passengers' travel narratives and descriptions of individual cities, plantations, and other notable sites along the river, as well as over 2600 period images portraying these scenes (http://dig.lib.niu.edu/twain/text.html; http://lincoln.lib.niu.edu/fimage/twain/search.php). Image Source: Harpers Weekly. 8 Jul. 1876: 549. Courtesy of the St. Louis Mercantile Library. Used with permission. The project web site complements these traditional library materials with several types of multimedia resources. These include original sound recordings of songs pertaining to the river, made from period sheet music (http://dig.lib.niu.edu/twain/sound.html). They also include an interactive map of the Mississippi Valley states (defined as all states bordering on the river), built with Geographic Information Systems technology, which features representations of census data at the county level (http://atlas.lib.niu.edu/Website/twain/viewer.htm). This map resource presents the project's collected text and image materials through a geographically oriented graphical interface as well. This allows site users clicking on a link to the city of Memphis, for example, to examine all of the project's text resources mentioning that place, in chronological order. Similarly, a click on a place link in the map can also enable users to review all image materials depicting that place, in chronological order. In addition to these primary source materials, the project has assembled original interpretive resources, in text and video formats, providing its users with concise summaries of the scholarly literature discussing Mark Twain's life, his work, and the Mississippi Valley in the nineteenth century (http://dig.lib.niu.edu/twain/video.html). Contributors to these materials include Shelley Fisher Fishkin of Stanford University; Robert Hirst of the University of California, Berkeley; Gregg Camfield of the University of California, Merced; Peter Kastor of Washington University in St. Louis; and O. Vernon Burton of the University of Illinois. Video materials include an original documentary film, "Mark Twain and the American Steamboat," which discusses Twain's observations on the rapid changes affecting Mississippi River life and communities in the decades following the Civil War. These interpretive materials can help non-specialist users to explore and understand the project's collected primary sources. Where scholars and students enrolled in a course of instruction may readily apprehend the issues and discourses informing nineteenth-century texts, members of the general public often lack knowledge of this context, and hence struggle to understand or enjoy these primary sources. Participating scholars' discussions seek to provide project users with a basic understanding of Mark Twain's work, as well as the Mississippi Valley of the nineteenth century, the setting for his most enduring works. The Mark Twain's Mississippi Project web site also provides K-12 educators with a set of lesson plans using digitized primary sources and interpretive materials to address national learning standards for American History. These materials make use of the project's Interactive Map resource, as well as text, image, sound and video resources (http://dig.lib.niu.edu/twain/teachers.html). May 13, 2009 - "The Council of Science Editors (CSE) bestowed its Meritorious Achievement Award on CrossRef at its annual meeting in Pittsburgh last week." "'This is only the second time CSE has granted the award to an organization rather than to an individual,' commented Monica Bradford, Chair of the CSE Awards Committee. 'We felt that the significant contributions CrossRef has made in improving the experience for users of online scholarly material merited our highest recognition.'" "'CrossRef epitomizes the goal of the award,' added CSE President Diane Scott-Lichter, 'which is to recognize the individual, and in this case the organization, that makes efforts to improve scientific communication through the pursuit of high standards. CrossRef's linking service and new initiatives such as CrossCheck are terrific examples of collaboration and cooperation in the scholarly community.' "
For more information, please see the full press release at <http://www.crossref.org/01company/pr/news051309.html>. May 12, 2009 - "Fedora Commons and the DSpace Foundation, two of the largest providers of open source software for managing and providing access to digital content, have announced today that they will join their organizations to pursue a common mission. Jointly, they will provide leadership and innovation in open source technologies for global communities who manage, preserve, and provide access to digital content." "The joined organization, named 'DuraSpace,' will sustain and grow its flagship repository platforms  Fedora and DSpace. DuraSpace will also expand its portfolio by offering new technologies and services that respond to the dynamic environment of the Web and to new requirements from existing and future users. DuraSpace will focus on supporting existing communities and will also engage a larger and more diverse group of stakeholders in support of its not-for-profit mission. The organization will be led by an executive team consisting of Sandy Payette (Chief Executive Officer), Michele Kimpton (Chief Business Officer), and Brad McLean (Chief Technology Officer) and will operate out of offices in Ithaca, NY and Cambridge, MA." "...DuraSpace will continue to support its existing software platforms, DSpace and Fedora, as well as expand its offerings to support the needs of global information communities. The first new technology to emerge will be a Web-based service named 'DuraCloud.' DuraCloud is a hosted service that takes advantage of the cost efficiencies of cloud storage and cloud computing, while adding value to help ensure longevity and re-use of digital content." May 7, 2009 - "President Obama has requested $265,556,000 for fiscal year 2010 for the Institute of Museum and Library Services (IMLS). The request, which was transmitted to Congress today, represents an increase of $1,453,000 over the FY 2009 enacted level for the Institute's programs and administration. The proposed budget will support museums and libraries as they provide unparalleled value to the public, fuel knowledge sharing, and energize our economy, creativity, and competitiveness." "'We are pleased to have President Obama's support for the nation's museums and libraries,' said Anne-Imelda M. Radice, Director of IMLS. 'With this proposed budget, IMLS looks forward to continued support of these institutions as they connect people to information and ideas.'" "The President requested $213,240,000 for the nation's 123,000 libraries. Of that amount, approximately 80 percent is distributed through the Grants to States program to the State Library Administrative Agencies (SLAAs) in each of the 50 states, the District of Columbia, U.S. territories, and freely associated state, according to a population-based formula. These grants help libraries meet the community needs, use technology to develop new service models and reach underserved populations." For more information, please see the full press release at <http://www.imls.gov/news/2009/050709.shtm>. Announced by Emily Nimmo, Humanities Advanced Technology and Information Institute (HATII), May 5 2009 - "As many of you will know DigitalPreservationEurope (DPE) are committed to making digital preservation materials available to the widest possible audience and to breaking down barriers to access. The release of a new series of short animations introducing and explaining digital preservation problems and solutions for the general public marks an important step reaching this goal. " "We are delighted to announce that the first animation is now ready for viewing at <http://www.youtube.com/watch?v=pbBa6Oam7-w>." "We believe these cartoons encapsulate complex digital preservation issues and problems and explain them in a funny and easy to follow plot. Please feel free to make use of these animations as part of your own work to raise awareness and understanding about digital preservation." To learn more about DPE or to access our suite of preservation resources and tools, please go to <http://www.digitalpreservationeurope.org>. May 4, 2009 - "Brian E. C. Schottlaender, The Audrey Geisel University Librarian at the University of California, San Diego, has been appointed to the Executive Committee of HathiTrust, a major collaboration of the nation's largest academic libraries to create a vast digital repository." "HathiTrust was launched last October by the 11 University of California libraries and the 12-university consortium known as the Committee on Institutional Cooperation (CIC). The collaboration, which will create a shared repository of the library members' extensive digital collections, will include millions of books, including public domain materials which will be available for reading online." "HathiTrust was named for the Hindi word for elephant, hathi, reflecting the enormous undertaking of congregating the collections of the nation's top research libraries as well as the essential qualities of wisdom, memory, and strength evoked by elephants. The elephantine size of the digitized holdings grows daily, with more than 2.8 million volumes, 104 terabytes, 33 miles, and 2,282 tons of materials digitized to date. The repository comprises digitized books, articles, and special collections, as well as a variety of 'born digital' materials." "...While the Google project is enhancing public access to digitized books from UC San Diego and other institutional partners, HathiTrust is focusing on long-term data preservation to support and advance scholarship. UC San Diego, along with other UC libraries, is also participating in a project to digitize public domain materials sponsored by the Internet Archive, currently totaling about 330,000 books. UC will contribute all of its digitized books to HathiTrust, unifying content digitized by Google and the Internet Archive. The HathiTrust is also committed to including public domain content from non-Google partners...."
For more information, please see the full press release at <http://ucsdnews.ucsd.edu/newsrel/awards/05-09Hathitrust.asp>. Announcement from Peter Kosewski, Harvard University, May 4, 2009 - "Harvard's Open Collections Program has launched "Expeditions and Discoveries: Sponsored Exploration and Scientific Discovery in the Modern Age." Through the new digital collection, Internet users can find thousands of maps, photographs, and published materials, along with field notes, letters, and unique manuscript materials on sponsored exploration and related scientific discoveries between 1626 and 1953." "'Expeditions and Discoveries,' which is made possible by generous support form the Arcadia Fund, is located at <http://ocp.hul.harvard.edu/expeditions>." "The collection offers digital access to published materials in the public domain that document worldwide exploration and discovery in general-with and without a Harvard connection. Users can search or browse materials by discipline or region, explore holdings related to 22 notable individuals, and discover information on additional expeditions from the Arctic to the Antarctic, from South America to Africa and Australia, and more." For more information on Harvard's Open Collections Program, visit <http://ocp.hul.harvard.edu>. April 30, 2009 - "CrossRef welcomed the American Psychological Association (APA) this week as its 50th participant in CrossCheck, the plagiarism screening service powered by iThenticate." "CrossCheck, a cooperative service from CrossRef and iParadigms, launched in June 2008. It provides publishers with web-based text analysis and a unique and growing database of scholarly publications against which to compare manuscripts and papers for duplication." "The growing CrossCheck database contains 13.8 million items from 23,000 journals, books, and conference proceedings. In addition to checking against documents from scholarly publishers, participants compare papers against relevant sources from the web and proprietary databases." April 30, 2009 - "The Council on Library and Information Resources (CLIR) has opened the second application period for its Cataloging Hidden Special Collections and Archives grant program. Information about the program, deadlines, and links to the online application and guidelines are available at <http://www.clir.org/hiddencollections/index.html>." "CLIR expects to award about $4 million in grants that range from $75,000 to $500,000. A review panel will evaluate proposals and select award recipients. Recipients will be notified in November 2009, and applicants may begin their projects at any time between December 1, 2009, and March 1, 2010." "The program will award funds to institutions holding collections of high scholarly value that are difficult or impossible to locate through finding aids. Award recipients will create descriptive information for their hidden collections that will be linked to and interoperable with all other projects funded by this grant, to form a federated environment that can be built upon over time. Funding for the program comes from The Andrew W. Mellon Foundation." For more information, please see <https://app.e2ma.net/app/view:CampaignPublic/id:9304.1959266639/rid:90b918c0db8dbbff5035ea957bdf96c8>. April 30, 2009 - "Science and engineering are advancing rapidly in part due to ever more powerful computer simulations, yet the most advanced supercomputers require programming skills that all too few U.S. researchers possess. At the same time, affordable computers and committed national programs outside the U.S. are eroding American competitiveness in a number of simulation-driven fields." "These are some of the key findings in the International Assessment of Research and Development in Simulation-Based Engineering and Science, released on Apr. 22, 2009, by the World Technology Evaluation Center (WTEC)." "...The nearly 400-page, multi-agency report highlights several areas in which the U.S. still maintains a competitive edge, including the development of novel algorithms, but also highlights endeavors that are increasingly driven by efforts in Europe or Asia, such as the creation and simulation of new materials from first principles." For more information, please see the full NSF press release at <http://www.nsf.gov/news/news_summ.jsp?cntn_id=114718>. April 29, 2009 - "College admission offices may take a student's MySpace, Facebook, Twitter, or other online social networking activity into account during the college admission process, according to a paper released (members only) by the National Association for College Admission Counseling (NACAC). One-fourth of colleges surveyed indicated that they used Web search or social networking technology to locate information about prospective students. The paper suggests that colleges are also more likely than not to use social media in promotion and student recruitment." "'Social media tools, like Facebook, Twitter and blogs, are key to communicating with this generation of students,' stated Joyce Smith, NACAC CEO. 'While still no substitute for face-to-face interaction, social media have opened lines of communication and inquiry for both students and institutions that were inconceivable only a decade ago.'" "The purpose of NACAC's research on social networking sites was to 1) present recent data collected by the author on the extent to which colleges and universities are using social media for recruitment; 2) highlight best practices for blogging and the use of other social media and Web 2.0 applications for those institutions who are new to these endeavors; and 3) begin to explore the ethical and legal issues inherent in engaging with prospective students through these media." For more information, please see the full press release at <http://www.nacacnet.org/AboutNACAC/PressRoom/2009/Pages/SocialNetworking.aspx>. April 29, 2009 - "In a year when newspaper cutbacks have made their own headlines, strong evidence of the changing nature of media use in America may be found in a single statistic: Internet users report a large increase in time spent reading online newspapers, according to the eighth annual "Surveying the Digital Future" project conducted by USC Annenberg's Center for the Digital Future." "In questions about reading online and print newspapers  key elements of the eighth annual comprehensive study of the impact of online technology on America  the Digital Future Project found that Internet users read online newspapers for 53 minutes per week, the highest level thus far in the Digital Future studies. In contrast, Internet users in 2007 reported 41 minutes per week reading online newspapers." "In addition, print newspapers still have strong brand identities and reader loyalty. In fact, while the Digital Future Project found increased reading of media content online, the study also found that a large percentage of Internet users remain loyal to print versions of newspapers. When asked if they would miss the print edition of their newspaper if it were no longer available, 61 percent of those who read newspapers offline agreed  up from 56 percent in 2007." For more information, please see the full press release at <http://annenberg.usc.edu/AboutUs/News/090429CDF.aspx>. April 29, 2009 - "NISO is pleased to announce the approval by the NISO Voting Members of a new work item to focus on perfecting single-sign-on (SSO) authentication to achieve seamless item-level linking in a networked information environment. A new working group will be formed under the auspices of NISO's Discovery to Delivery Topic Committee to create one or more recommended practices that will explore practical solutions for improving the success of SSO authentication technologies and to promote the adoption of one or more of these solutions to make the access improvements a reality." "...This new work follows on NISO's February 11th webinar on this topic, where the issues and potential benefits of SSO authentication were looked at from library, authentication tool, and content provider perspectives...."
For more information, please see the full press release at <http://www.niso.org/news/pr/view?item_key=f0fd8be2c351aacc9e8ab819ba2a4a51e8303bcf>. Announcement from George Calderaro, Columbia University, April 28, 2009 - "Columbia University's School of Continuing Education has launched a new part-time Master of Science in Information and Digital Resource Management, which teaches the conceptual and technical skills necessary to fulfill the information management requirements of business, nonprofit and governmental organizations...."
"...Information and digital resource management is a rapidly advancing field with new technologies as well as legal, social and policy questions arising at an astonishing rate. The program, which evolved from Columbia's Information and Archive Management Graduate Program, is designed to teach students how to organize and evaluate information created, purchased and employed by an organization. " "The new graduate program trains students to understand the laws that govern the collection and use of information in digital and non-digital formats as well as electronic social media in a professional workplace environment. Students master the wide range of information resources produced by city, state and national governments, as well as by international governmental organizations and commercial providers. Students also learn to work with an organization's I.T. department and third parties to design and implement digital resource and asset management systems that support the organization's business objectives." "The first class in the new program will enroll in September 2009. For more information go to <http://www.ce.columbia.edu/InfoDigital> or email <ce-info@columbia.edu>." April 28, 2009 - "Researchers at the University of North Carolina at Chapel Hill have launched a center that will bring together scholars and technical experts to solve the pressing problems of managing and sharing today's deluge of digital data. In addition to building shared collections, the Data Intensive Cyber Environments (DICE) Center <http://dice.unc.edu/> supports software systems for data curation and data preservation so that today's knowledge will be available for future generations." "The DICE Center, which is funded by external research grants, draws on leading data management technology whose advanced generic nature makes possible a remarkable array of uses, from helping the National Archives preserve the nation's digital information including records that document our nation's experience, to helping digital libraries cope with the ever-increasing size and complexity of digital knowledge, to enabling sharing of digital data by large-scale interdisciplinary scientific research collaborations across the nation and the globe...."
"... The Data Intensive Cyber Environments (DICE) group joined Carolina's nationally recognized School of Information and Library Science in fall 2008. The award-winning research group, formerly of the San Diego Supercomputer Center at the University of California, San Diego, has an international reputation in developing digital data technologies." For more information, please see the full press release at <http://sils.unc.edu/news/releases/2009/04_DICEcenter.htm>. "Stewardship of America's Legacy: Answering the Call to Action"
April 28, 2009 - "A national initiative designed to save the nation's at-risk museum and library collections brings its message to Buffalo, New York, June 16-17, 2009 when the Institute of Museum and Library Services (IMLS) presents 'Stewardship of America's Legacy: Answering the Call to Action' at the Albright-Knox Art Gallery and the Burchfield Penney Art Center. The forum, organized in cooperation with Heritage Preservation, gives special attention to collections held in small and medium-sized museums, libraries, and archives." "A national effort, IMLS's Connecting to Collections: A Call to Action, is a multi-year, multi-faceted leadership initiative. The Buffalo event is the final of a series of meetings in four US cities held in 2008 and 2009. The meetings have been designed to raise awareness among leaders of small and mid-sized museums and libraries about the importance of collections care and to give them practical information, tools, and resources to inspire action nationwide..."
"...Participation in the conference is free of charge and open to representatives of museums, libraries, archives, and other cultural institutions. On line registration is required at www.imls.gov/collections." For more information, please see the full press release at <http://www.imls.gov/news/2009/042809.shtm>. April 27, 2009 - "The University of Pittsburgh Press, in collaboration with the University of Pittsburgh Library System and the Chicago Digital Distribution Center (CDDC), is making nearly 500 out-of-print Press titles available again for scholars and students around the world." "Representing the full range of scholarly series and subject areas published by the Press, these titles are now part of the University of Pittsburgh Press Digital Editions collection, fully searchable and freely accessible to anyone with an internet connection through the University of Pittsburgh Library System's D-Scribe Digital Publishing Program. Over the next year, they will also be made available for purchase in reasonably priced paperback editions through the CDDC. Readers and researchers may read and search the full texts online, and those who wish to have a print copy may purchase it through retail outlets or directly from the Press." "The University of Pittsburgh Press Digital Editions (UPPDE) may be viewed through the Press Web site, <http://www.upress.pitt.edu>, click Digital Editions. Print editions of these titles, as they become available, may be purchased through the shopping cart icon on each book page of the Press Web site or at <http://www.bibliovault.org>." For more information, please see the full press release at <http://www.upress.pitt.edu/htmlSourceFiles/pressReleases/PittPressDigitalPR.pdf>. April 23, 2009 - "Today, the National Science Foundation (NSF) announced it has awarded nearly $5 million in grants to 14 universities through its Cluster Exploratory (CLuE) program to participate in the IBM/Google Cloud Computing University Initiative. The initiative will provide the computing infrastructure for leading-edge research projects that could help us better understand our planet, our bodies, and pursue the limits of the World Wide Web." "In 2007, IBM and Google announced a joint university initiative to help computer science students gain the skills they need to build cloud applications. Now, NSF is using the same infrastructure and open source methods to award CLuE grants to universities around the United States. Through this program, universities will use software and services running on an IBM/Google cloud to explore innovative research ideas in data-intensive computing. These projects cover a range of activities that could lead not only to advances in computing research, but also to significant contributions in science and engineering more broadly." For more information, please see the full press release at <http://www.nsf.gov/news/news_summ.jsp?cntn_id=114686&org=NSF&from=news>. April 23, 2009 - "The San Jose School of Library and Information Science has announced the Global e-Campus for Library and Information Science. For more than fifty years the School has been an early adopter of distance learning technology, including closed circuit television and interactive videoconferencing. Today, students benefit from high quality synchronous and asynchronous instruction and networking opportunities, choosing from more than 250 courses a semester and interacting with peers and instructors through web conferencing, social networking platforms, a web-based learning management system, and immersive environments. These technologies provide a rich learning environment and better prepare students to apply technology in their professional lives. San Jose's students live in 45 states and 14 countries, and full and part-time faculty live on three continents. The new virtual nature of the program and its administrative infrastructure allows the School to recruit top faculty, regardless of where they live. Clear expectations for faculty and students, small classes and continual high investment in advanced distance learning technologies contribute to academic and professional success." "Beginning in Fall 2009, the School will complete the move to a fully online delivery for the 43-credit Master of Library and Information Science (MLIS) degree, joining the Master of Archives and Records Administration degree. Governance and administration have similarly moved to increased use of Web-conferencing and other information and communication technologies." For more information, contact Lisa Valdez, <lvaldez@slis.sjsu.edu>. April 14, 2009 - "The Board of the Council on Library and Information Resources (CLIR) today voted to merge the Digital Library Federation (DLF) into CLIR as a program of the Council, starting July 1, 2009. The vote follows recommendations by a DLF Review Committee in March 2009 to merge the two organizations, and a unanimous vote of consent by the DLF Board on April 8." "With the merger, DLF's current members will become "charter sponsors" of the DLF program at CLIR. CLIR will hire a program officer to lead DLF initiatives. CLIR will continue to convene forums and will also convene special thematic sessions, with a goal of more in-depth exploration of collaborative activities." "A transition committee drawn from the CLIR and DLF boards will guide the initial stages of the merger; the DLF Board will also nominate two members to serve on the CLIR Board. The new members' terms will start in July; they will run for three years and are subject to renewal." For more information, please see the full press release at <http://www.clir.org/news/pressrelease/09dlfclir.html>. April 14, 2009 - "Today, the Bill & Melinda Gates Foundation announced a $5 million grant to the OCLC library cooperative to develop a public information campaign that will help public library leaders heighten awareness of the needs of local libraries and increase support for the services they provide during these challenging times. OCLC will pilot the campaign in select areas of Georgia and Iowa starting this summer as well as a limited number of other communities which will be selected later this spring. Later in the year, OCLC will make available community awareness campaign materials and other guides to assist library leaders throughout the country in their efforts to strengthen support for local libraries." "The current economic crisis has led to dramatic increases in library visitation across the nation, as people rely on libraries for free computer and Internet access to conduct job searches, access government services, learn new workforce skills, and use other resources they can no longer afford at home." "The tightening economy has also put library funding  80 percent of which comes from local sources  at risk. Many library systems predict deep state and local funding cuts in 2009, a growing burden for the roughly half of all libraries struggling against declining or flat budgets." For more information, please see the full press release at <http://www.oclc.org/news/releases/200924.htm>. April 13, 2009 - "The value of libraries in communities across the country continued to grow in 2008  and accelerated dramatically as the national economy sank and people looked for cost effective resources in a time of crisis, according to the American Library Association's (ALA) annual State of America's Libraries report, released today as part of National Library Week, April 12-18, 2009." "U.S. libraries experienced a dramatic increase in library card registration as the public continues to turn to their local library for free services. More than 68 percent of Americans have a library card. This is the greatest number of Americans with library cards since the American Library Association (ALA) started to measure library card usage in 1990, according to a 2008 Web poll conducted by Harris Interactive. " "The report also says library usage soared as Americans visited their libraries nearly 1.4 billion times and checked out more than 2 billion items in the past year, an increase of more than 10 percent in both checked out items and library visits, compared to data from the last economic downturn in 2001." "However, public funding did not keep pace with use, according to a survey conducted by the ALA. Forty-one percent of states report declining state funding for U.S. public libraries for fiscal year 2009. Twenty percent of these states anticipate an additional reduction in the current fiscal year." For more information, please see the full press release at <http://www.ala.org/ala/newspresscenter/news/pressreleases2009/april2009/2009state.cfm>. April 9, 2009 - "The Harvard Office for Scholarly Communication and the American Physical Society (APS) announced jointly today that they have entered into an agreement to facilitate faculty compliance with the University's open access policies when Harvard faculty members publish in the APS journals, comprising Physical Review, Physical Review Letters, and Reviews of Modern Physics. As a result of the new agreement, APS recognizes Harvard's open access license and will not require copyright agreement addenda or waivers, in exchange for Harvard's clarification of its intended use of the license. In general terms, in exercising its license under the open access policies, Harvard will not use a facsimile of the published version without permission of the publisher, will not charge for the display or distribution of those articles, and will provide an online link to the publisher's definitive version of the articles where possible. The agreement does not restrict fair use of the articles in any way." "Three of Harvard's ten faculties have passed open access resolutions within the past 14 months, most recently Harvard's Kennedy School of Government. The main beneficiaries of the Harvard-APS agreement will be physics faculty members, who are no longer obliged to acquire waivers of Harvard's prior license. In addition, other institutions and their authors may find the agreement to be a useful model in their interactions with APS and other scholarly publishers." For more information, please see the full press release at <http://osc-dev.hul.harvard.edu/announce.php>. April 1, 2009 - "UNESCO and 32 partner institutions will launch the World Digital Library, a web site that features unique cultural materials from libraries and archives from around the world, at UNESCO Headquarters on 21 April. The site will include manuscripts, maps, rare books, films, sound recordings, and prints and photographs. It will provide unrestricted public access, free of charge, to this material...."
"[U.S. Librarian of Congress] James Billington first proposed the creation of a World Digital Library (WDL) to UNESCO in 2005, remarking that such a project could 'have the salutary effect of bringing people together by celebrating the depth and uniqueness of different cultures in a single global undertaking'. In addition to promoting international understanding, the project aims to expand the volume and variety of cultural content on the Internet, provide resources for educators, scholars and general audiences, and narrow the digital divide within and between countries by building capacity in partner countries." "The WDL will function in Arabic, Chinese, English, French, Portuguese, Russian and Spanish, and will include content in a great many other languages. Browse and search features will facilitate cross-cultural and cross-temporal exploration on the site. Descriptions of each item and videos with expert curators speaking about selected items will provide context for users, and are intended to spark curiosity and encourage both students and the general public to learn more about the cultural heritage of all countries." For more information, please see the full press release at <http://portal.unesco.org/ci/en/ev.php-URL_ID=28484&URL_DO=DO_TOPIC&URL_SECTION=201.html>. Announced by Anna-Lena Johansson, Lund University, April 1, 2009 - "The Directory of Open Access Journal (DOAJ) - Lund University Libraries and the e-Depot of the National Library of the Netherlands (KB) today announced the start of a cooperation in order to secure long-term preservation of open access journals. The Swedish Library Association is generously acting as sponsor." "Long-term preservation of scholarly publications is of major importance for the research community. New formats of scholarly publications, new business models and new ways of dissemination are constantly being developed. To secure permanent access to scientific output for the future, focussed on the preservation of articles published in open access journals, a cooperation between Directory of Open Access Journals (DOAJ - http://www.doaj.org/), developed and operated by Lund University Libraries and the e-Depot of the National Library of the Netherlands (http://www.kb.nl/e-Depot) has been initiated." "...At present DOAJ and KB carry out a pilot project aimed at setting up a workflow for processing open access journals listed with DOAJ. In the pilot a limited number of open access journals will be subject to long term preservation. These activities will be scaled up shortly and long term archiving of the journals listed in the DOAJ at KB's e-Depot will become an integral part of the service provided by the DOAJ." For more information, please contact Lars Björnshauge <lars.bjornshauge@lub.lu.se> or Anna-Lena Johansson, <anna-lena.johansson@lub.lu.se> . Announced in NSDL Whiteboard Report for April 2009 - "Now available: NSDL EduPak, which is an all-in-one, open source, education digital repository solution bundle that provides a general platform for building digital libraries united by a common data model and interoperable applications." For more information, please see <http://wiki.nsdl.org/index.php/Community:EduPak>. March 20, 2009 - "In a move aimed at broadening access to MIT's research and scholarship, faculty at the Massachusetts Institute of Technology have voted to make their scholarly articles available to the public for free and open access on the Web." "The new policy, which was approved unanimously at an MIT faculty meeting on Wednesday, March 18 and took immediate effect, emphasizes MIT's commitment to disseminating the fruits of its research and scholarship as widely as possible...."
"...Under the new policy, faculty authors give MIT nonexclusive permission to disseminate their journal articles for open access through DSpace, an open-source software platform developed by the MIT Libraries and Hewlett Packard and launched in 2002. The policy gives MIT and its faculty the right to use and share the articles for any purpose other than to make a profit. Authors may opt out on a paper-by-paper basis." For more information, please see the full press release at <http://web.mit.edu/newsoffice/2009/open-access-0320.html>. March 20, 2009 - "InnoCentive, Inc., the global open innovation marketplace, and Nature Publishing Group (NPG), a leading scientific and medical publisher, today announced a partnership to facilitate greater scientific collaboration and open innovation." "Under the agreement, InnoCentive and NPG will work together to stimulate the involvement of scientists worldwide in solving global scientific challenges, via an online marketplace for problems and their solutions. The concept of "open innovation" addresses the research challenges that organizations face, by using external expertise to solve problems and drive development of new products and technologies. Global challenges such as the development of better protection against malaria, finding ways to shorten the clinical trials process and the design of environmentally friendly, sustainable product packaging, to name a few, require broad and diverse expertise." "InnoCentive's open innovation web site provides a platform for organizations, companies and government agencies (known as 'Seekers') to post innovation 'Challenges' for the public (known as 'Solvers') to solve for financial reward. NPG and InnoCentive intend to jointly produce an online platform for open innovation challenges in the coming months, to facilitate the participation of NPG's large expert audience." "This agreement comes at a pivotal time when businesses, especially those in life sciences, are endeavoring to maintain research and development activities with reduced budgets and resources. The partnership of NPG and InnoCentive will accelerate the uptake of open innovation as a complementary business model that has particular appeal during a global economic downturn. For more information, please see the full press release at <http://www.nature.com/press_releases/innocentive.html>. March 19, 2009 - "The Andrew W. Mellon Foundation has awarded the Council on Library and Information Resources (CLIR) $4,303,000 to support a second year of its Cataloging Hidden Special Collections and Archives program." "The program was created in 2008, with Mellon funding, to identify and catalog special collections and archives of high scholarly value that are difficult or impossible to locate through finding aids. Award recipients create descriptive information for their hidden collections that will eventually be linked to and interoperable with all other projects funded by this grant." "In 2008, CLIR awarded a total of $4 million to 15 projects nationwide. It expects to award the same amount of funding to new projects this year. " March 19, 2009 - "The Institute of Museum and Library Services (IMLS) is seeking applicants for the Save America's Treasures (SAT) 2009 grant program. These grants support the preservation and conservation of nationally significant intellectual and cultural artifacts such as collections, documents, sculpture, and art, and historic structures and sites. IMLS partners on the project with the President's Committee on the Arts and the Humanities, the National Park Service, the National Endowment for the Arts, and the National Endowment for the Humanities. The National Trust for Historic Preservation, the program's principal private partner, raises private matching funds for projects and provides resources and assistance to a host of SAT grantees and preservation projects all across the country...."
"...In 2009, grant amounts range from $25,000 to $700,000 for collections and from $125,000 to $700,000 for historic property and sites projects. All the awards must be matched 1:1. Eligible applicants include nonprofit, tax-exempt 501(c), U.S. organizations, units of state or local government, and federally recognized Indian Tribes." "The Save America's Treasures program accepts online applications through <http://www.grants.gov>, the federal online grantmaking portal. Paper applications will not be accepted. The deadline for applications is May 22, 2009." For more information, please see <http://www.imls.gov/news/2009/031909a.shtm>. March 19, 2009 - "The Institute of Museum and Library Services (IMLS) is proud to announce the launch of its new series of data notes and research briefs to inform library and museum policy. 'These publications are part of an overall plan to develop and disseminate short, intermediate, and long-range research projects,' said Anne-Imelda Radice, Director, IMLS. 'Our goal is to provide reliable and consistent data on museums and libraries that these institutions can use to help demonstrate public value.'" "The first data note in the series, Libraries Use Broadband to Serve High Need Communities, was released today and focuses on the role that public libraries play in providing access points to broadband services for people in urban and rural areas, and families in need. To read the data note, please go to: <http://www.imls.gov/pdf/DataNote2009_01.pdf>." "Future IMLS Data Notes will provide a quick highlight about an interesting piece of data. Upcoming topics include: the governance structure of museums; the library workforce; and summer reading programs." For more information, please see the full press release at <http://www.imls.gov/news/2009/031909b.shtm>. March 18, 2009 - "The ISBN International Agency and the International DOI Foundation have agreed a way of including the International Standard Book Number, ISBN, in a DOI syntax in a standard way (known as the Actionable ISBN, or ISBN-A), thereby expressing the ISBN within the DOI system. The ISBN has long been also available in a bar code form, and this development follows the same model." Dynamic tracking of digital-product sales." "By definition, an ISBN-A identifies the same thing as the ISBN, and is assigned on behalf of the ISBN agency. ISBN-As do not automatically exist for every ISBN; they exist only once an appropriate DOI agency has registered them in the DOI System. Several ISBN agencies are already also DOI Registration Agencies." For more information, please see <http://www.doi.org/news/DOINewsMar09.html#2> and a factsheet at <http://www.doi.org/factsheets/ISBN-A.html>.